God owns everything, so in a sense His home is everywhere. But He Himself resides in the spiritual world in a place known as Goloka, the highest spiritual region. Reaching Krishna there is the highest achievement of human life. 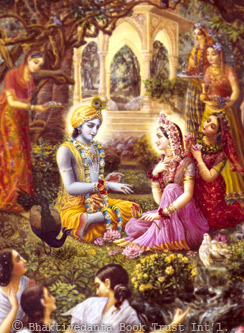 Goloka is self-illuminated, and everyone there is liberated, shining with pure love for Krishna. Because Krishna is the center of everyone’s heart, there is complete unity and peace. Goloka is built of transcendental gems that yield whatever one wants. The natural surroundings are beautiful, full of diversity and opulence. In Goloka, every word is a song, every step a dance, every moment new, fresh, and exciting.